I have become sort of a legacy instructor at the Swannanoa Gathering’s Guitar Week, missing only three Gatherings over the past twenty years. I was humbled to find out in 2014 that my classes closed out within minutes of the opening of on-line registration and have always carried long waiting lists. I read all my student evaluations. Here are a few of them along with other responses to my teaching. Scott’s Right Hand’s From Krypton! Ainslie is a beautiful stylist who respects the country blues and acoustic blues music, feels it deep down to his soul, and understands its essence. He is not just an important bridge to the original blues, he is an important teacher and protagonist of the genre. 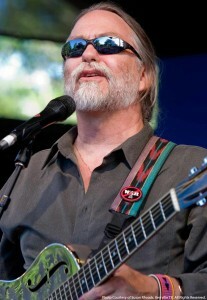 Ainslie is one of the most important cultural protagonists of the old blues and Southern musical traditions. Scott Ainslie has taken on the monumental task of transcribing all of Robert Johnson’s recorded blues songs and succeeded with flying colors…Robert Johnson/At The Crossroads, (Hal Leonard, 1992) stands head and shoulders above any other collection of transcriptions. Ainslie has the exceptional blend of ability to play and teach, with the willingness to do so. Ainslie is truly an extraordinary teacher and a gifted musician. The things I learned from him, rhythm and right hand technique, slide technique, riffs, and some of the secrets of Robert Johnson’s music, have created a strong foundation that has taken my playing to another level. What a passionate, knowledgeable, engaging instructor. Scott really helped break bad habits and instill the kind of right hand discipline necessary for playing this kind of music (Blues). I wish I had had him around when I first picked up the guitar. A brilliant musician and wonderful person, Ainslie is informative, well-prepared, and very encouraging. Class was great. Excellent – what a teacher! In addition to wonderful singer, guitar player, etc. he genuinely cares about his class – each person. That is the feeling he exudes. And Scott has the ability to break things down into small, clear segments. I learned a mountain of new things this week! Ainslie has the exceptional blend of ability to play and teach, with the willingness to do so. He gave me new physical abilities and tools to develop at home. One of the finest musical instructors I’ve known. Scott’s suggestions to help improve guitar accompaniment in all our songs were frighteningly incisive and I was very pleased with it. This is a class I would take every year it is offered. I have been a student of Scott’s at Augusta and I think he is the best! Class is demanding, but the presentation is non-threatening and punctuated with good humor. Seeing his name on the staff list is what got me to come. Scott is the heartbeat of the Blues program. A humble giant of the Blues who shares his soul in class. An excellent teacher and a superb human being. Class was great. Way more than I expected.